Generally speaking, the slower your club-head speed, the greater the benefit from higher loft and a more flexible shaft. The following parameters are intended to give general suggestions. Your age, flexibility, and knowledge of your personal tendencies to hit a high or low ball should be factored in. Our standard lofts are 11, 13, and 15 degrees. 9-degree lofts are available by special order (+$20), but not generally recommended for average golfers. In fact, most of the touring pros now use more than 9 degree lofts. We recommend the 11-degree loft for those who already hit the ball in the air with a nice high trajectory without any trouble. This loft, with its higher center of gravity, will hit about as high as traditional drivers, but with a more natural arc and longer roll out, and it will be straighter. We recommend the 13-degree loft for those who need to hit it a little higher with ease. We recommend the 15-degree option for those who struggle to hit the ball in the air, or if they use their 3-wood off the tee more effectively than their drivers. If you are not sure which loft to select, keep this thought in mind: While a lower loft may hit one or two drives farther than a higher loft, a higher loft will hit it straighter and can produce longer total yards of playable shots over the course of an entire round. So when in doubt, go to the next higher loft. Our proprietary Flexcelerator™shafts are fillament-wound graphite, made to our specifications. The grip-end is a beautiful gold, then dissolves into candy-apple red to match the head. The are 60 gram with a torque of 3.2. They are medium kick point, except the "L" flex which is a low kick point. Click here to see a larger view of the shaft. Your average distance will help you pick the appropriate flex. By "average" we mean your normal average distance, not your best or worst. As an additional reference, we will include club-head speed below, in case you have had your swing evaluated in a launch monitor. The majority of golfers will use a Regular or A-flex. Our standard lengths are 45.5" (115.6 cm) and 44.5" (113.0 cm). Measurements are from the end of the grip down the back side of the shaft to the heel where it contacts the floor when the club is in the address position. 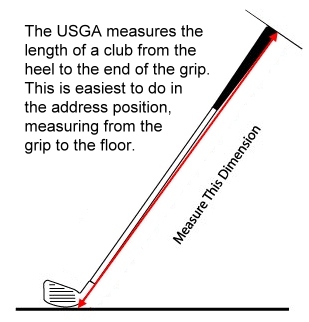 This is the USGA method of measuring shaft length. Custom lengths are $20 extra. We can make your club any length up to 47" (119.4 cm) in 1/2" increments. The order form includes custom length options. Grip preferences and sizes are very personal. There are many brands with various colors, sizes, and textures and they are very inexpensive to purchase locally. Therefore, we use a standard high-quality black grip with a leather-like wrap design and encourage you to purchase a custom grip locally.